“Man lives in the sunlit world of what he believes to be reality. "Chapter Twenty: Tales From The Darkside"
For the first few episodes of Riverdale, I often wrote about how important a show like it—and the entire teen genre, in general—can be. More specifically, I argued that while the younger audience watching won’t necessarily get every single reference, homage, and pastiche the characters make, the point is to get them interested in what those references, homages, and pastiches mean. To get them interested in the source material, in the series’ inspirations. It’s a regular complaint about teen dramas that the characters either don’t speak like real kids or that they make references kids wouldn’t make, but that’s a large part of the appeal. A highly referential show like this—and one that doesn’t just exist to make references—needs to understand and actually care about its references. Not just so its aware audience members can appreciate them, but so its less-aware audience members can also to learn to appreciate them. As I’ve written many times, Riverdale wears its inspirations on its sleeve; and in doing so, it opens up these inspirations to new generations. For as much talk as there is about how hard left Riverdale is as a show, “Chapter Twenty: Tales From The Darkside” is essentially a modern take on the type of episode Dawson’s Creek would do. It’s actually the type of episode Dawson’s Creek did do, as it’s a combination of “The Scare,” “The Longest Day,” “The Unusual Suspects,” and even “Four Scary Stories.” Again, Riverdale isn’t exactly reinventing the wheel: There is no doubt that Dawson’s Creek also did these episodes based on very specific source material. But Riverdale is very clearly doing the type of thing shows in this genre need to do in order to last well past its years. Even with its uniform stylistic and intentionally anachronistic choices, Riverdale is never just one thing. Which is where “Chapter Twenty” comes in. Its mission statement is simple: Cross The Texas Chainsaw Massacre with Pulp Fiction (and some other overall inspirations peppered in), and you apparently get “Tales From The Darkside.” It’s a love letter from Riverdale to so many of the things that makes it what it is, and despite never quite focusing on loving just one thing, it never feels scattered. In fact, it’s one of Riverdale’s greatest strengths that it can make its pop cultural blender approach to storytelling actually work. For example, the thing about the Texas Chainsaw Massacre opening to this episode—other than its role as a brilliant and downright awesome start to an episode that lives up to that promise—is that it doesn’t pigeonhole the episode into just being that. In fact, based on what it states about the chaos the Black Hood causes and the lives lost, it’s impressive that the entire episode isn’t just one thing at all. Besides, given how much the Black Hood still has to do in order to live up to this description, it’s better to see this as a promise for the rest of the season and not just one episode. Before the episode separates into these “Tale From The Darkside” segments, there’s a little bit of set-up. Pop’s Death Diner is now the hub for Black Hood messages, which you’ve got to think is worse than those riots Pop mentioned that one time. And with that, we get the latest Black Hood challenge, which is for the citizens of Riverdale to stop sinning for just 48 hours. It’s a fool’s errand, even if the townspeople actively tried not to sin, because there’s no way anything anyone does would be good enough for this maniac. Plus, it’s impossible for the Black Hood to know everyone’s dirty little secrets in order to know who’s been naughty and who’s been nice. But when you look at our primary players and the usual suspects as a microcosm of this den of sin known of Riverdale, of course the town is going to fail the Black Hood’s test. The question simply becomes just how tremendously they’ll fail. In an episode of great choices, perhaps the best one is Riverdale’s decision to bring out the big guns with the Candyman himself, Tony Todd. To do so in the first segment of the episode is also quite the bold statement, but it certainly lives up to the expectation. At the reveal of Tony Todd, I literally said out loud to my dogs, “I love this show.” Let it be known that these first two segments (“Archie & Jughead” and “Josie”) are genuinely scary, and a major reason for that is how they capitalize on the genre in every way the possibly can. It’s not just the writing (James DeWille)—it’s the score, the direction (Dawn Wilkinson), the acting, the casting, it’s everything. Tony Todd is an invaluable resource, because from the moment he shows up to “help” Jughead and Archie, he’s got backwoods horror exposition creep down. Not that Greendale is “backwoods,” but if there’s one thing “Chapter Twenty” makes clear, you might want to stay out of Greendale. Especially after midnight. “Archie & Jughead” has to work as a balancing act, both as a horror story—one that continues to set up a potential Sabrina, The Teenage Witch spin-off series—and a character story, looking into the state of Jughead right now. Specifically in terms of Jughead emotionally and mentally drowning, with nowhere to turn. Yes, he’s back with Betty, and his friendship with Archie is also back to a good place (even when Archie interferes in gang business). But while Jughead doesn’t spend the entire time with Archie, the time he does spend with him points to some big problems Jughead isn’t ready to fully deal with. He brings up early on how Archie owes him one for narc-ing back at the drag race, but when Archie tries to press Jughead on what he’s doing, he’s very honest (while still being evasive in other ways) about how he’s really just “living minute-to-minute here.” So while Archie is having pie-in-the-sky fantasies about a lavish New York lifestyle for the core four, Jughead is barely hanging on here. We saw last season what happens when Jughead literally called for help: His mom wouldn’t let him move to Ohio to be with her and Jellybean. She wrote him off as a lost cause, and that was long before he was a Serpent like his old man. So when he reaches out to Archie to help him look into the Black Hood/Riverdale Reaper and Archie ends up having plans, he tries to play it cool but obviously feels like Archie just blew him off. 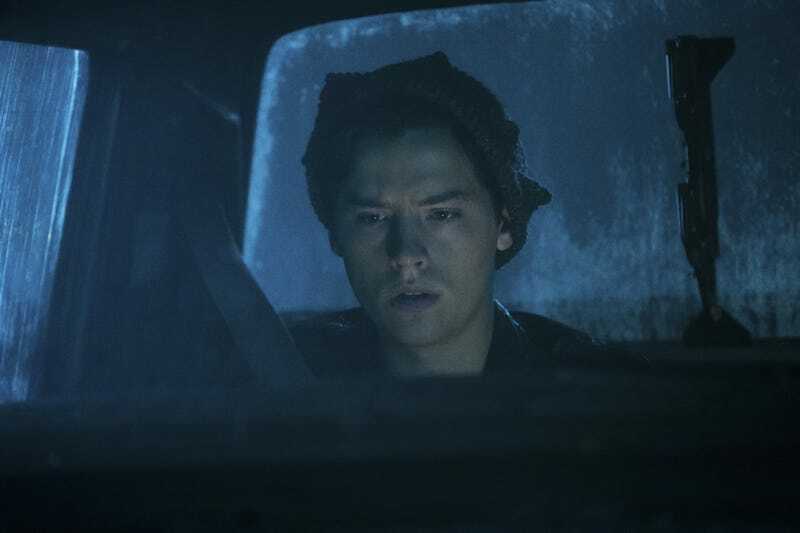 Jughead is legitimately scared—about the Ghoulies, about the Black Hood, even about life in the Serpents—but when he tries to reach out, he feels like he gets burned. First of all, arguably none of that stuff was eliminated to make Riverdale what it ended up being, and it was still great. In fact, that description of the series always felt like it was trying to make and sell Riverdale as more normal than it actually is. But now that it’s definitely not trying to do that anymore, the reason I even brought the quote up in the first place is because we now have Jughead transporting mystery crates to Greendale with visible Lovecraftian references on them. As it says on the crate, while no one addresses that fact: “MISKATONIC UNIVERSITY VIA H.P. LOVECRAFT / POLAR EXPEDITION JAN. 13, 1923.” While this looks to be more an Easter Egg than an actual plot point, it’s worth nothing it’s also officially a reference to more tales from the darkside in an episode paying homage to Tales From The Darkside. “Archie & Jughead” is the segment in this episode that relies most on more surreal elements to provide the scare and terror, but that’s obviously not to say it’s not without that tether to reality. Getting back to Riverdale proper snaps that reality back into effect, and that’s when Penny Peabody’s true colors are revealed. In retrospect, Penny Peabody felt like a Quentin Tarantino character in Riverdale upon her introduction, the same way Nick St. Clair was a Bret Easton Ellis character in Riverdale. And now with this episode’s framing device, the Snake Charmer officially gets to play up that Tarantino inspiration. “Josie” is a segment that hits all of the classic slasher beats perfectly, to a point where it even looks like it’s going to even end up like one. Before it busts out the severely twisted conclusion, that is. While “Archie & Jughead” has a relatively anticlimactic ending, horror-wise—though the character beats and importance to Jughead’s overall story can’t be ignored—”Josie” finds a way to also include a mini-tragic love story without ever letting up on the creep factor. It’s also the most consistent story here in terms of tension, as the former segment is up and down with the camp and the emotional drama and the latter does something completely different from the rest of the episode. From the moment Riverdale reveals a message from Josie’s “secret admirer,” something doesn’t quite feel right. And it’s not just because the score says as much throughout but because the message is almost at “I KNOW WHAT YOU DID LAST SUMMER” level of disturbing. The “I’LL BE WATCHING YOU” isn’t charming even as it comes with a teddy bear, and especially not as it comes with Cheryl joking about Josie’s admirer being the Black Hood. The Cheryl moment, at that point, is just another example of these Riverdale kids being insensitive to a major danger (like New Reggie was with his Black Hood “prank”). But once the segment reaches its conclusion, it’s clear it was an integral moment for Cheryl to get the ball rolling on her disturbing plan. Last episode, the Lodge parents seemingly played chess for 24 hours straight, but here, Cheryl’s chess board is all behind the scenes. Skipping right to that conclusion, the signs of course are there as Cheryl even tells Josie she feels indebted to her for being her guardian angel when it came to Nick St. Clair. We know how Cheryl can be in these situations, after all. Remember, she decided to give Fred Andrews the kiss of life as repayment for Archie giving her the kiss of life. That’s Cheryl Blossom’s thing. Unfortunately, Cheryl’s well-meaning gratitude turns into Josie getting dumped by The Pussycats (Melody does not play) and Josie experiencing some major stress-related polyps. That would all be bad on its own, but for Cheryl to be the orchestrator of all this—and to basically traumatize her best friend in order to be her demented fairy godmother—is so aggressively Cheryl Blossom it hurts. There was a lot of discussion in season one about how Cheryl is either a hero or the villain of this series from scene-to-scene, and this episode shows just how dangerous that power can be. Cheryl Blossom hits Josie’s life like a tornado, and honestly, she kind of ruins it in one fell swoop. It’s impressive but terrifying, because it’s also based around those moments where Cheryl is infantilized (as her need to be the only one in Josie’s life reeks of a child who doesn’t want to share her toy) but with an absolutely mature, diabolical mind behind it. She also makes the perfect slasher villain, despite there not actually even being a slasher in the episode. You have a returning Chuck Clayton, who ends up playing a version of Billy Loomis who’s actually not criminally insane. You also have the creepy janitor, who I’m honest enough to admit I knew couldn’t have been the “admirer” because Boy Meets World taught me it’s never actually the creepy janitor. (And as it turns out, the janitor is really just a nice guy who wants to see the talented students of this school thrive. But this segment is directed brilliantly to make you think he’s creepy. It’s actually quite unnerving until the final confirmation that it was all Cheryl.) You even have Josie walking the dark, empty halls of Riverdale High at night, asking if anyone’s there—when she’s not walking through the overly steamy showers, that is. The outlier in this story is of course the diner scene between Josie and Chuck, but that’s because it’s this segment’s homage to Pulp Fiction. And a rather iconic one too, which is unspeakably important in a segment where the black girl character on a teen drama gets to play the Final Girl in an episode’s slasher homage. Trust me. The thing is, nothing actually gets to an unsafe place in this story until the final drawing and pig heart moment. But the combination of Cheryl planting the Black Hood seed in Josie’s head, Mayor McCoy admitting to Josie how bad things are right now in terms of safety, and the way this entire segment is presented, it feels like something’s at stake. That right there is perhaps the perfect encapsulation of life with the Black Hood in Riverdale, especially for the people who aren’t like Archie and Betty. For the people who aren’t going to bring the fight to him. And as this segment touches on, for the people who are considered “other” in Riverdale. The reason Mayor McCoy is even more scared than usual is because the Black Hood’s presence has also brought the return of Riverdale’s “Letters to the Mayor.” You’ll perhaps remember back in “Chapter Three: Body Double” (the original Chuck Clayton episode) when Josie tried to explain “the struggle” to Archie by mentioning the type of letters her mother got from people, simply for daring to be a black woman running for Mayor in Riverdale… only for Archie to miss the point completely and chime in that he campaigned for her mom, so he’s not part of the problem. Well, now apparently people are writing letters to Mayor McCoy for daring to be a black woman Mayor who can’t keep a “serial killer” (and whatever other horrors that come to town) at bay. “It’s like they’re emboldened by him,” Mayor McCoy tells Josie, speaking about the Black Hood but also speaking about a much larger systemic issue. That one of these letters also mentions Josie gets a bit lost in the Cheryl reveal at the end of this segment, but it’s something that doesn’t just go away with the end of this episode. It’s something the McCoys will always have to deal with, even if it’s not at the forefront of the plot. But Josie also has to deal with a stalker she never even learns to be a hoax, and it truly gets to her. As much crap as Riverdale deserves for the Black Hood not actually killing a bunch of people—as messed up as that sounds—that doesn’t mean the show’s fake outs aren’t still impressive. That of course includes Kevin’s quick image of getting stabbed while cruising, but it also applies to Josie’s nightmare here of the Black Hood slitting her throat. It lasts just long enough that it looks like Riverdale might really go there too, which would open up a can of worms but still make quite the statement. Betty and Veronica’s segment is interesting, because it’s allowed to intentionally be more fun from the start. Especially when it comes to the Tarantino-esque split screens this episode suddenly uses for their phone conversations, which also serve as a reminder of the contrast between B&V, even when they’re not together. This fun isn’t the same as something like Cheryl Blossom’s “Out of the way, Bert and Ernie” either; this is a segment that makes sure the episode ends on something other than traumatizing misery. For instance, there is most certainly no wacky score at any other point in this episode, but it’s almost immediate here. At the same time, that’s also because it’s the one story in this episode where anyone involved even wants there to be a horror story. From the opening teaser, when Betty comes up with the idea that the Black Hood is in the sheriff’s department (and is the sheriff), she sticks to her guns, attempting to turn what is both a collection of reasonable explanations and also impressive transparency on Sheriff Keller’s end into excuses to deflect from the fact that he’s the Black Hood. It’s the type of story that would lead to another “I’m not crazy” moment if it were Archie leading this charge. Actually, Betty even quickly has that moment when she’s trying to keep pushing her theory to Veronica. But part of what prevents it from being just that is the Veronica half of it, as this plot is relatively light compared to the other segments. And that’s simply because Veronica suggests the least scandalous Riverdale possibility of all: that Sheriff Keller is having an affair. The way it’s played, the episode doesn’t quite agree with Betty that Sheriff Keller is the Black Hood—and it makes clear along the way that any smoking gun she thinks she has is honestly a water pistol—but it also makes sure to play Veronica’s quest for truth on the adultery front as more of a joke than it ends up being. Sure, as Betty decides to follow her Black Hood theory and Veronica goes for her affair hunch, Veronica obviously thinks she picked the sexier choice. But look at the moment where her sleepover reconnaissance mission ends up with Kevin trying to teach her how to play some nerdy board game. Bless them both. This is where the point about this episode not quite agreeing with Betty comes in. While Betty is usually The One when it comes to finding the answers, she’s really barking up the wrong tree here, and the episode never pretends that’s not the case. Because Sheriff Keller is an open book except for his one secret: He is having an affair, and it’s with Mayor McCoy. Betty and Veronica decide to hide this real world “horror” from Kevin, because they don’t want their friend to find out their dad’s a ‘villain’ that way. * It’s not supernatural, it’s not pig hearts, it’s just some bummer news. * We don’t actually know or learn if Sheriff Keller is cheating on his wife. We learn here that she’s a military woman stationed in Bahrain, but we have no idea if they’ve possibly separated or come up with an arrangement. And Kevin doesn’t know that either, because it wouldn’t exactly be his business (since he’s a kid). The Riverdale kids star in their own personal horror movies in “Chapter Twenty.” (To make it even clearer, when it comes to Betty Cooper, having absolutely no leads and running into constant dead ends is a horror story for her. Plus she’s already been mentally and emotionally tortured by the Black Hood, so it’s okay for her stress load here to not be at that level.) Everyone in town is scared, and outside forces are only making them even more scared. It’s absolute chaos, and it’s just getting started. “Chapter Twenty” beautifully channels that fear and chaos, turning it into a bizarre hybrid of genres as well as a cohesive story (despite how separated everyone is). This episode is genuinely scary, while also being funny and fascinating—and despite playing with the structure, it still manages to make the episode integral to the plot. All killer (sort of), no filler. Through Pop, the Black Hood promises at the end of this episode that the Riverdale residents’ failure will lead to a “reckoning.” Hopefully that reckoning can live up to the standard and expectations set by this episode. “The dark side is always there, waiting for us to enter — waiting to enter us. Riverdale Roulette: I’m going to go ahead and suggest the Dawson’s Creek episodes I mentioned in the review: “The Scare,” “The Longest Day,” “The Unusual Suspects,” and “Four Scary Stories.” They truly are the precursors to this episode, even if that wasn’t the intention here. While I’m still thankful to Genevieve Valentine for covering “Chapter Nineteen: Death Proof” (yes, a Quentin Tarantino title reference, also after the episode where The Pussycats beat Nick St. Clair Death Proof-style) for me, I’m disappointed in myself. It was the episode with the drag race I’ve been begging for since this season began. They even used New Reggie’s car, proving I was also right to suggest he was a racing for pinks type of guy. Shame on me. Since the episode opening chose to bring Texas Chainsaw Massacre into this, the season really has to keep its promise of more (actual) bloodshed. So far, the Black Hood has succeeded with Ms. Grundy and Mr. Phillips, but with that record, it looks less like he’s going for “sinners” (at least when it comes to the serial killing) and more like he’s going for “bad teachers” (Cameron Diaz, Ari Graynor, etc.). Basically, an episode opening like that is now a contract, in a way Jughead’s book has never been. Archie’s one fault in this episode is busting a tire and not having a spare. But, considering it was right outside that Riverdale/Greendale line, I’m thinking it was more an omen than an actual Archie screw-up. So what do you think? Are the Riverdale Reaper and The Black Hood connected? So, Penny Peabody’s vendetta against FP: He totally got her pregnant and didn’t help raise the kid, didn’t he? And let me guess, the kid is Sweet Pea. Peabody —> Sweet Pea. If that’s the case, this is also why these kids need to go to each other’s homes more and learn about their attractive parents. Veronica was also right on that front. Cheryl might just self-tattoo “JOSIE 4EVA” on her body sometime soon, and that’s worth waiting to see. On the bright side for Chuck Clayton: At least now he’s been redeemed in the audience’s eyes. He still could stand to apologize to women he actually wronged, but as far as genuine human compassion goes, he appears to have developed a sense of it. The thing about Chuck being a teenager—and one who thankfully never physically did anything wrong—is that he can be truly redeemed if the show wants him to be. He can also recover from getting knocked down a little bit here, because no one said redemption was going to be easy. I’ve been joking about it for awhile just to myself, but “Josie” really made me wonder if Mayor McCoy and Sheriff Keller were having a thing. Not just because he’s always there whenever she does anything, but because we—at that point—knew absolutely nothing about the relationship between Kevin’s parents. We knew Kevin got pissed at Betty for the fact that his dad told his mom about his cruising, but that didn’t answer anything. Like, why wouldn’t he tell his mom if they’re still together? So “Betty & Veronica” finally admits they are in fact a thing, but I’ve obviously still got questions. Veronica, sweetie. Your attempt to pump Sheriff Keller for information looked more like an attempt to pump Sheriff Keller himself. I’m sorry for writing that, but I’m also sorry for knowing there’s absolutely going to be fanfic built off that one scene. Also: “Archie Andrews, watch your back.” “I don’t do it for vanity.” Sheriff Keller is good. He’s very good. The thing about Betty going really hard for her “Sheriff Keller = Black Hood” theory is that part of her argument comes from Veronica’s rebuttal that Keller has known her since she was a kid. It’s essentially part of the argument as to why “Hal Cooper = Black Hood,” only Betty doesn’t apply that same logic and suddenly start pointing the finger at her father. In her mind, for some reason, the best possible explanation is that her gay best friend’s supportive father is obsessed with her to the point of eradicating their entire town of “sin.” It’s cold-blooded, but given the past couple of episodes, it’s not even the most cold-blooded Betty Cooper moment of the season. It’s impressive, really. These people couldn’t even stop sinning for two days. And assuming we’re bringing the Commandments into this sin discussion, let’s see who broke what. The one about adultery? Sheriff Keller and Mayor McCoy. The one about honoring one’s parents? Jughead and Josie. The one about idolatry? Cheryl Blossom, big time. The one about dishonesty? Betty, Veronica, Cheryl, the adulterers, Josie, and Penny Peabody. Oh, bearing false witness? Josie and obviously Cheryl. Shout out to @Kevidently for alerting me that the crate bit is also a reference to Creepshow, which I definitely need to put on my own personal Riverdale Roulette.